The latest issue of the Automotive News Europe monthly magazine goes live on Monday. 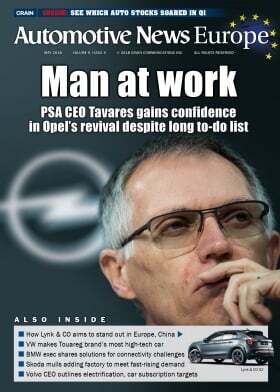 The new edition looks at how PSA Group CEO Carlos Tavares' integration of Opel/Vauxhall is progressing. Tavares’ rationale was simple: If PSA was to grow, it needed to be more than just a French company. The Opel deal would create a “European champion,” fueled by synergies from combined engineering and r&d, and Tavares’s own obsession with eliminating waste from the production process. So far, Tavares says, things are on the right track, and he has “no regrets” about buying Opel/Vauxhall. Our cover story looks at the positive steps Opel/Vauxhall has made since the sale and what still needs to be done. Hyundai sees Europe as a key market for its Nexo fuel cell car because the region has more advanced plans than other global markets to expand its refueling infrastructure. The Nexo offers a range that is 200 km more than its predecessor, the fuel cell version of the Tucson/iX35 SUV. Find out more details on the Nexo.